Unusually, I was irritated enough yesterday morning to post about what happened when I paid Fookes Software via Paypal for a licence to use their product, Note Tab Pro. Instead of receiving an email with a registration code, I instead received an email from Plimus, who (it turned out) handle web-sales for Fookes Software, telling me that there was going to be a delay of up to 12 hours whilst their staff reviewed the order “for quality purposes”. In fact, the registration code arrived about 20 minutes later, but of course I hadn’t known that it was going to do so, and I was so annoyed by Plimus’s “we’ll take control of your money and just hang onto it while we conduct reviews into our internal operating procedures” practice that I emailed Fookes Software to draw it to their attention. Later in the day, someone from the Fookes Software Helpdesk wrote back to tell me that the delay had occurred because the email address I used for my order was different from my Paypal email address, as a result of which Plimus had carried out a “manual review”. In fact, I don’t believe the email I supplied via the website did differ from my Paypal email address, but even if it had done I don’t consider it appropriate for a vendor (or its agent) to process a transaction–which has the effect of removing money from a person’s bank account via Paypal–and ‘ask questions’ later. I’ve been using Paypal for many years, and I’ve never had this experience before. Anyway, Fookes Software made it clear in email that they didn’t think there was any sort of problem. There was no sort of acknowledgement that any of this might have been the source of legitimate irritation or concern, and despite the fact that my transaction was with them they suggested that I should take the matter up with Plimus if I was dissatisfied. Is it just me, or does anyone else think this casual manner of dealing with other people’s money is completely inappropriate? When we provide vendors with our bank details (either directly, or via a third party site like Paypal) I think we’re entitled to expect that the vendor will recognise its legal (and moral) obligation to provide what we’ve paid for without delay. If there’s an internal review to be conducted, then I feel I’m entitled to expect it to be conducted on their time, and not mine. When I go shopping for vegetables, I don’t expect to hand over my money at the till only to find the sales assistant slipping my bag of veggies under the desk and telling me to wait while his/her supervisor conducts a review into the way in which he/she dealt with my order. If supermarkets tried that, customers would be calling in the police! This online practice is exactly the same, except that ISTM that in one respect it’s worse. If I’ve handed over cash I have only that cash to lose, but when I’ve handed over my bank details to strangers over the internet I have absolutely no idea what the person on the receiving end might attempt to do with them next. If we can’t have faith in online retailers to conduct these sorts of transactions scrupulously, and with complete transparency, then the whole system breaks down. Fookes Software have made it crystal clear that they consider me to be making a fuss about nothing, and it may be that Plimus feel the same. At least Plimus, though, had the courtesy to contact me in email earlier today in order to explain their practice. They did *not* suggest that there was any issue about my email address (and indeed I’ve spoken to Paypal, who have confirmed that no enquiry was made by Plimus of them in relation to the transaction), and so for the second time I’m left wondering why Fookes Software suggested that in the first place. Instead, Plimus simply explained that they subject a number of orders to random, retrospective checks as part of their standard, automated anti-fraud systems. For the reasons set out above I feel they’ve missed the point, but I do appreciate their having had the courtesy to contact me about this. In the meantime, I won’t be buying any further products from Fookes Software, and nor will I be buying any products online via Plimus. There I was, though, happily grazing through interesting writings about snow, hail, Bushbuddies, thunder and lightning–basically, all the trappings of a typical Pyrenean July–when, before I knew it, I found myself reading a grizzly description of Andy chomping his way through minced piglets (in the form of saucisson) and innocent little pigs’ trotters, and fantasizing about eating a sleeping pig! Wow… Looking for early ideas for a Christmas present? My head spun when I saw this just now on the Lakeland page. (No… that’s Lakeland as in cooking accessories; not Lakeland as in walking.) I was drooling over jam jars, thermometers and jelly bags, but took a quick break to see what else was available. If I had the spondoolies spare right now, or a partner who needed pampering/placating, I think I’d be on the phone placing an order! So! Who’d have believed there was such a thing as a robot vacuum cleaner, that would “happily plod from room to room” while you sat with feet up on a kitchen stool, browsing through TGO Magazine and stuffing down home-made bread and jam? I thought it sounded too good to be true, but the reviewers sound very happy. Bloody hell! I’ve been using a trial version of Note Tab Pro for a month or so, as an HTML editor. This morning I spotted a change that I need to make to a page on my website, but when I tried to start the programme it told me that the trial period was over. I went to the web page and paid for it with Paypal–£20–and although the company, Plimus, took my money immediately I received an email from them as follows. the processing and may cause a double-billing to your credit card. What a bloody cheek! They’ve taken my money (my Paypal account confirms it) but they haven’t sent me the registration code! I’ve emailed them, but they haven’t yet responded. What on earth makes manufacturers who sell software online for immediate download imagine that it’s okay to make people who’ve paid for a product wait any period of time at all, let alone an indefinite period, while they ‘review the order for quality purposes’? I came across this sort of thing a couple of times a few years ago, when online selling was less common, but not recently. Nor had I expected to encounter it from the vendor of a well-known product like this. Well, it all arrived about 20 minutes later, so all’s well etc etc. It turns out that Fookes Software, who produce Note Tab Pro, employ Plimus to sell it for them. I’ve written to Fookes Software to tell them about this weird practice, and I’ll be interested to see whether they reply or not. Bringing out there in here… and eating it! When I’m walking I love looking at the wonderful stuff growing all around me. Now I’m home I’m converting some of it into things I can enjoy here. 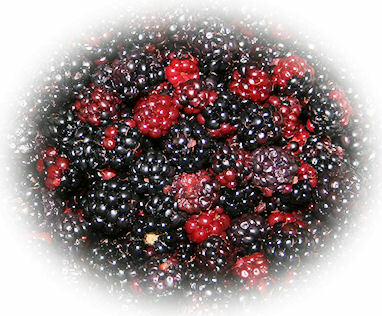 A couple of days ago I went blackberrying with Tim and Kate (a couple of Challenge pals) in the woods. 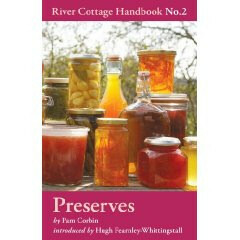 I was planning to convert my share (which also seemed to include at least half of what Kate and Tim picked) into blackberry jam, but I’ve just bought a copy of Pam Corbin’s utterly wonderful River Cottage Handbook No.2: Preserves, and I’ve decided to make a yummy blackberry and crab apple jelly instead, and also some fruit leather. Watch this space! Today I’ve been a hive of industry. Which isn’t really like me at all 🙂 Still, though, a couple of days ago I noticed a recipe for Hawthorn Ketchup in Pam’s book, and so yesterday I rode my bike down to the pine woods and then walked out to the place where my sister and I scattered my mother’s ashes in early May. At the time we’d noticed a hawthorn bush in particularly prolific and beautiful flower, and it occurred to me when I read the recipe that it would be really lovely to pick the berries from that bush and make them into ketchup, in memory of Maa. I don’t actually like tomato sauce, but I felt this would be a little different, and I’m sure my sister will appreciate the idea. So here it is! 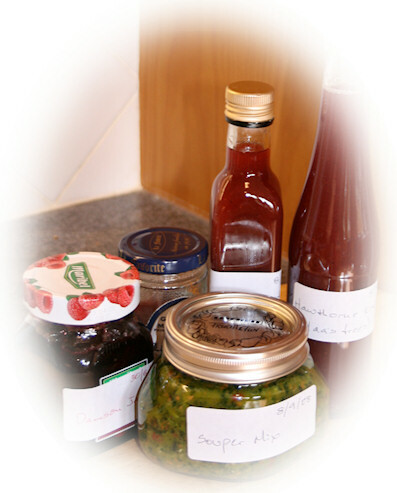 Along with some of the damson jam I made a couple of weeks ago, and a jar of Pam’s Souper Mix, which is an inspired way of adding taste to soups ‘n’ stuff when there’s no good stock at hand. After that I put my cunning marmalade plan into action. I’ve been meaning to make marmalade for about half a lifetime, but today was my first attempt. I don’t like ultra-sweet things, and so after reading through Pam’s marmalade recipe I decided to try a lime and grapefruit mixture instead of orange, since the really good, sour oranges won’t be available until early in the New Year. 7 jars of lime and grapefruit marmalade! 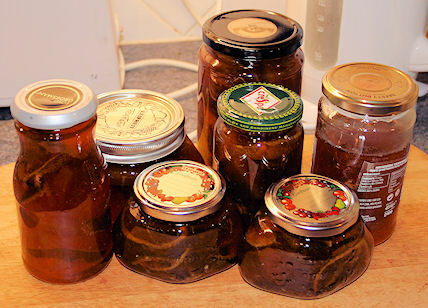 So now I have 7 jars of lime and grapefruit marmalade, and I can hardly believe it! It took 40, rather than 15, minutes to reach setting point, but c’est la vie. I’d learned my lesson from the damson jam (which has to be hacked out of the jar with a hammer and chisel), and so I was determined not to boil it down too far. At the same time, though, I didn’t want to be able to pour it out of the jar onto my toast. I reckon it’s just about right, and it certainly does taste of limes and grapefruit. Tomorrow I’m driving to Lakeland to buy a jelly strainer and stand thingy, and then I’ll make the blackberry and crab apple jelly and some rosehip syrup. Ooh! J’ai almost forgotée mes lovely soused herrings and soda bread lunch! 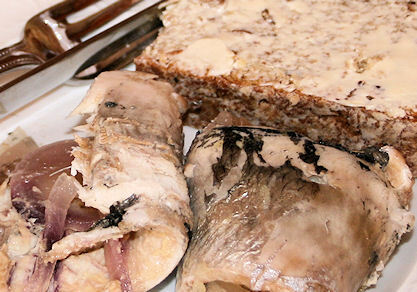 I made these soused herrings last week some time, and the bread a few days later. Anyway, it’s really lovely, I find, to be able to go to the fridge and get out yummy things I’ve cooked myself. I just love this song, so I couldn’t resist the urge to post it here. There’s no religious significance in it for me, btw–I don’t consider myself to be a ‘religious’ person, partly because IMO organised religions of virtually every hue are responsible for/used as an excuse for just about all of the continuing significant conflict in the world. However (i) I love the rhythms and the tune, particularly at the beginning, and (ii) the lyrics certainly do strike a chord with me. I’d love to see the sentiment translated into reality. This is my pal, Adrian Legg, playing one of my favourite tunes, Midwest Sunday. I found it on YouTube just now: it’s ripped from the video on which I first encountered Adrian. After Adrian comes Buster B. Jones. I met Buster at an RMMGA bash when I went over to the States for the Healdsburg Guitar Festival in 2001. One of the blokes who lives there, Bob, held a party in his garden, and one of the other blokes brought Buster, who sat happily with a beer (or several) for over an hour, just picking and telling stories. Buster told me that he loved my English accent. You are currently browsing the Peewiglet's Plog blog archives for September, 2008.